What would you say to a very versatile food that’s fat-free and loaded with nutrients? This’wonder vegetable’ is as sweet as pumpkin pie or could be salt and peppered and treated just like a French Frye! Just as easy to prepare as any white potato, the sweet potato far surpasses its brightly colored cousin in nutrient performance. White potatoes contains no vitamin A, however the sweet potato is loaded with vitamin A (from beta-carotene). They are also a excellent source of manganese, vitamin B-6, potassium, iron and copper. Along with being a powerful anti-oxidant source, SP’s have a very low glycemic index. This means that the carbohydrates in a SP have a very low effect on blood sugar levels. This means steady energy and less prospect of body fat production. White potatoes on the other hand have a high glycemic index, which may raise glucose levels rapidly and cause body fat storage. A small sweet potato (about 3 oz or 80 grams) has about 90 calories. Even a medium sized SP only has about 130-160 calories. Don’t worry about the kids liking them. That is easy! I have fed many young children SP chips (which I bake). Kids find the new’orange colored French fries’ enjoyable and exciting. Slather with ketchup, mustard, or any other way you would eat a normal French Frye. Let’s not forget the sweet potato patties, which it is easy to make or locate pre-made. Brown them up quickly in a skillet or bake. 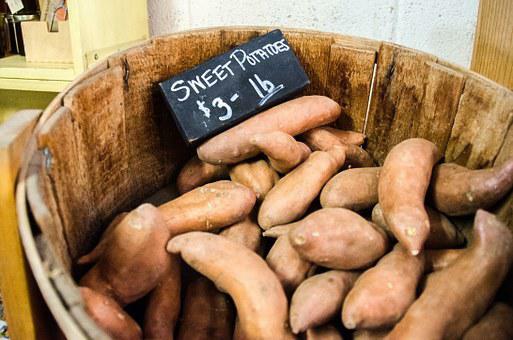 Sweet potatoes are so good however, that it is not hard to eat them the easiest way of all. Baked, microwave, or boiled. Treat them just like any white potato. But for a tasty twist, sprinkle some cinnamon (which is excellent for helping to stabilize blood glucose ) on top. If you want it a little sweeter, add only a teaspoon or two of brown sugar. The tender sweet potato – dab them with salt and pepper, cinnamon, brown sugar, ketchup, mustard, baked with cheddar cheese (like scalloped potatoes), so many creative ways to enjoy this super healthy and delicious food! Enjoy and be healthy! They are even great with hot sauce!